In this season of reflection, the team at Will I Be Next? is hopeful about the future. 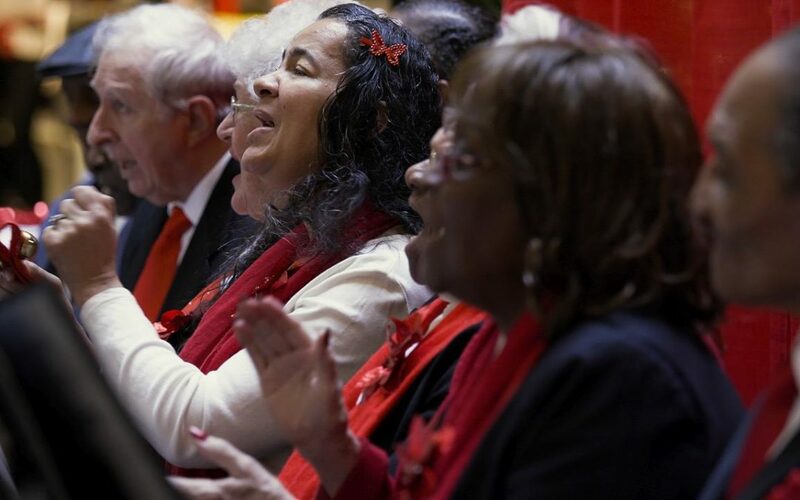 The Amazing Grace Choir (photo) is an initiative of the Wisconsin Alzheimer’s Institute, and is reducing the stigma of Alzheimer’s disease and dementia in Milwaukee and providing quality time for caregivers and their loved ones. In Minnesota, The Roseville Alzheimer’s and Dementia Community Action Team and local library branches in the area have teamed up to provide “Memory Minders.” Memory Minders are kits that contain activities designed for library-goers with memory loss. In Roseville, they’ve been implementing a dementia-friendly community for five years! In Tempe Arizona, the mayor is spearheading the effort to have Tempe become the first Dementia Friendly city in Arizona. Five dementia friendly initiatives are underway in Sheridan County, Wyoming, population of about 30,000. The community wants to “embrace this phenomenon because we will all be affected by it.” There are five initiatives in the planning process. Initiative #3 is “Build a Health Care Continuum for Dementia Needs” that includes assuring integration of care across health and social services. Initiatives large and small are happening across the country to promote living in community with people and their caregivers who are impacted by dementia. Leaders and volunteers are growing in numbers. Walls are being torn down. Momentum continues to build. Hard work is the stuff real hope is made of. For it is hope coupled with taking action. This kind of hope translates to a new tomorrow; a future that is better than what came before it. Happy holidays from Will I Be Next? Partnering with Diverse Communities in Research: It Can Work!